Liz: I try to keep an eye out for some of the kookier projects people are using their Raspberry Pis in. This autonomous, solar-powered, Atlantic-exploring work-in-progress fits the bill precisely (and it has a great name and incorporates Tupperware into its design), so I asked Greg Holloway, the Mind Behind, to write a few words about what he’s doing for us. Hoist the mainsail, Greg! Massive 25 foot waves, 60mph winds, torrential rain, lightning, and the Kraken. None of those things should be put anywhere near a Raspberry Pi. On the Atlantic Ocean all of those are commonplace, and that is exactly where I’m sending my Raspberry Pi. The project is called FishPi, and the aim is to develop an Autonomous Marine Surface Vehicle, and have it cross the Atlantic Ocean. 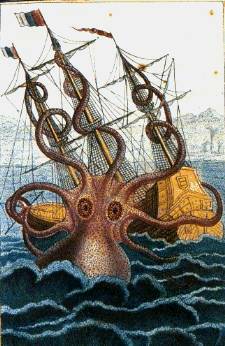 I don’t suppose it will happen quite like the illustration depicts when the Kraken shows up; FishPi will be powered by a 130watt solar panel, so there will be no masts or sails. The propulsion will run from batteries, charged by the solar panel, and it will utilise a Kort Nozzle to gain maximum thrust from what will be limited power. There’s a long way to go yet before the Raspberry Pi gets its sea legs, but that’s not to say progress has not been made. At the moment my time is being spent developing the Proof-Of-Concept Vehicle. The POCV has a hull of 20 inches, so it’s quite small. Below deck sits a brushed 540 motor coupled to a 2.5:1 reduction gearbox, which in turn drives a ducted 40mm Kort propeller. There’s also a servo which will rotate the nozzle to turn the vessel. The Raspberry Pi is going into a waterproof container, an upside down lunch box, along with all the other important components. The important bits will run on the i²c bus, a GPS, a servo controller board (which will drive the rudder and the Electronic Speed Controller (ESC) for the motor), and a compass. I hope to attach the Raspberry Pi’s camera once it becomes available, if it’s not ready in time a USB one will do instead. One of the systems I’m looking at now is the power for the POCV, and it looks like I’ll be running it from six 1.2v NiMh batteries. Power to the Raspberry Pi will come from an LDO outputting a regulated 5v, a similar LDO will be used to provide 3.3v for the devices on the i²c bus. The ESC will draw directly from the battery pack, but the output to the motor will be controlled by the Raspberry Pi via the Servo controller board on the i²c bus. The batteries are to be spread around the hull to help balance it on the water and to add ballast for stability. There is a lot of head scratching going on, and I’m always ready to hear fresh ideas, and of course the occasional warnings associated with undertaking such a task. The project website is at fishpi.org, you’re all welcome to pop onto our forum, and follow the projects progress, and there is also a twitter account; @TheFishPi. I’ll be taking the FishPi along to the Nottingham Hackspace Raspberry Jam on Tuesday the 3rd of July. Feel free to ask questions, make suggestions, and if you’re raucous enough, you can join in with some sea shanties too, ye landlubbers. Anyway, I haven’t stress tested it yet, I expect the project will generate enough stress as time goes. More than enough to test anyone, or anything :) It only cost £1.75 so if it breaks, I’ll get another. Maybe I should have bought two to start with. I’m thinking of cutting the side clips off to give extra clearance so it will sit lower in the hull. We’ll see ho things go. I can’t check ‘cos I threw it out, but I think mine was actually made by Addis or another Tupperware-alike. I have been looking at pelican boxes for the prototype…. my mad little sister used Pelican cases for camera, solar cells etc when she went canoeing around Norway a coupla years ago. They worked great. Greg will be answering questions here when he’s away from work, afaik. But I’m guessing it’ll be self-righting, like a rubber ducky. Tupperware may get brittle in sunlight over a long period of time. There has been some confusion here with the purpose of the Proof-Of_Concept Vehicle (POCV). Allow me to explain. The POCV is not design to run at sea, but on lakes. The website (http://fishpi.org/proof.html) explains its function in more detail. 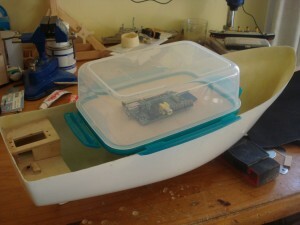 Also a skeg to stop the prop/rudder picking up weed and rubbish. Maybe a back up sail? Oh and antifoul to bottom to stop barnacles. The batteries will be mounted low down in the hull, near the bottom. And then (somehow) turn on the RPi again once the batteries have recharged enough to a specific level. Yup, thats exactly right, there is a lot of development that will need to go into the power monitoring system. I’ve not looked into it much yet though so I’m still not sure on where to go with it. What about tracking and telemetry? Add a GPS receiver and a satelite uplink to the FunCube or other suitable spacecraft for relay to ground tracking stations? The POCV will only have GPS. Tupperware is NOT UV stabilized. Also consider using desiccant packs and\or vapor phase corrosion inhibitors inside to mitigate any moisture issues. Additionally, In a salt water water environment 316 or 316L stainless steel is the only way to go. Will you be recording anything? Photographic evidence, GPS location, humidity, temperature, amount of sunlight, amount of rain? It’d spend a long time on see, a long time to log interesting data no matter where it ends up! yes I hope to log everything. what will be logged, and how often will depend power needs compare with power supply. The POCV will have the basics required for navigation plus a few toys like a camera, but the full package of instruments will be tested on the prototype. I think it will come in handy when you have to beach the boat, or avoid boats/wharfs close to shore. Just promise me if there’s decent surf when you come into the beach PLEASE attempt to catch a wave!! perhaps you could test your prototype in Lock Ness…. i can just see the headlines Pi discovers Nessie. Curious why you’ve chosen a brushed motor when the brushless ones available these days are generally so much more efficient? I would have thought you’d want to harness every ounce of power you can. Also – will you be swapping out the linear regulators on the Pi for switching ones? That should halve the Pi’s comsumption. For the moment cash is the controlling factor. Brushed motors and controllers are cheap, as are linear regulators. The prototype will be a more refined vehicle, it will be a test-bed for all that has been learnt from the POCV, and much much more. Fair enough. HobbyKing.com and giantcod.co.uk do some very inexpensive brushless motors, but for your atlantic run I would have thought a Hacker or something uber efficient and reliable would be a good bet. Brilliant project! I recommend an onboard Taser as a Kraken repellent. If that seems too extreme, as a “warning shot” an arm could pop up holding a jar of cocktail sauce to warn him of his impending fate should he get too close. Amazing work. However, please consider Loch Ness for your pocv or prototype. Let’s be realistic and scientific here; there is no kraken, but you might find Nessie! I know what’s really going on here…hacking from international waters!! Pretty awesome idea but it needs a better design–maybe a buoyant torpedo shape or something. The standard boat-like shape will be capsized within a few hours or days at most. The torpedo will just keep going no matter what. Next will be Pi in the Sky, a robotic aircraft! I’d avoid an ESC altogether and use a relay – ESC’s use power themselves and I would imagine basic on/off control of the motor will be sufficient – the only thing and ESC brings to the table is the ability to have variable speed. This will reduce your costs and also remove a fail point – ESCs can over heat easily and die at the hint of moisture…. If it were me I’d use a brushless motor (they can e had for pennies off ebay) and a basic brushless driver circuit – just for on and off again. The thing is, with a brushed motor, you run a very real chance of the brushes wearing out mid-voyage. in fact, it’s a certainty if you plan to have the boat out for any real length of time. Good luck. I did something like this in 1990 for my engineering degree (z80 compatible, programmed in Modula-2/assembler) but mine was controlled from a computer ashore (steer 270, speed 3). And GPS and solar panels didn’t exist – but it had a flux-gate compass and so knew which way to go and it could tell me where it was pointing, the temperature and battery voltage. Best bit was making a kitchen rudder for it (waterproof tube, inside a tube, inside a tube stuck to the fibreglass hull). I think the interesting bit for you is to make sure that you have some way of making it leak water quicker than it gets in the hull and before it destroys the batteries! Except for the publicity it gives the Pi, I cannot understand why a DuinoMite-Mini would not be used as this little computer in this project, as it is built for industrial applications, uses less power, and thus would have a better chance of finishing the trip. I only encountered the DuinoMite computers when looking for information on the Pi, received several the day after ordering, and had a project up and running in about 3 hours from first opening the box. Can someone program a Pi to use less power by turning off the resources that you do not use? I don’t think that Nessie needs HDMI. I’ve looked at the DuinoMite and it uses Basic Language and may not be as feature rich as C+ or Python when working with GPS or Satellite Libraries. Sensors? Sonar maybe? I wouldn’t mind tracking the progress of the prototype when it goes on its voyage! Interesting news article, this is radio controlled, but could be a pi robot. One thing definitely worth looking at is using a design that avoids the need for any moving hull penetrations like a properllor shaft. 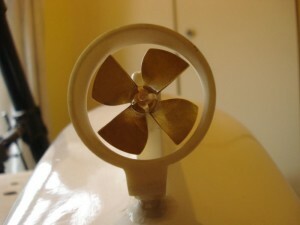 Right now, there will be a small-but-steady leakage up the propellor shaft. While it won’t matter on a lake because it’s not going to spend more than a few days in the water, the real thing is probably going to spend many weeks on the Atlantic. For example, a catamaran design with the motor between the hulls – the challenge there is to make it self-righting, but that’s not insurmountable. 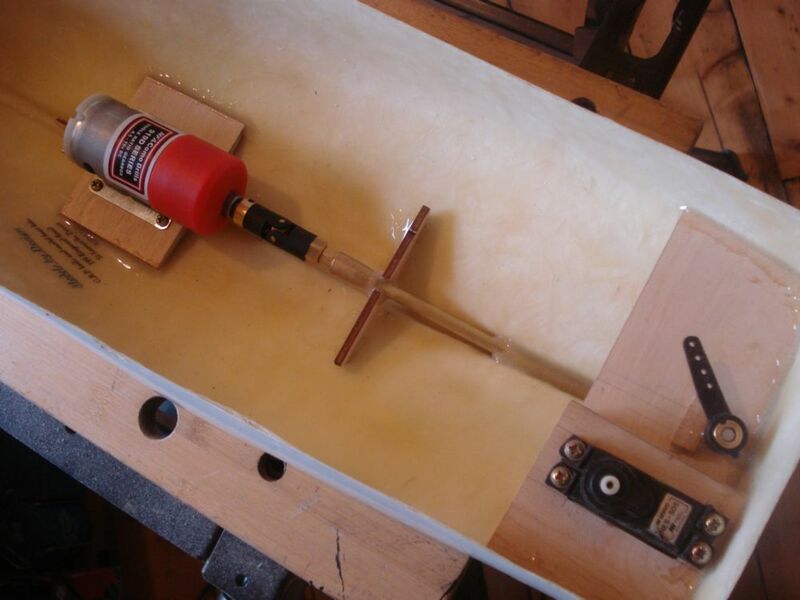 – It’s much easier to make a completely watertight enclosure than to try to bail out a ‘nearly’ watertight one, and you’ll never make a completely watertight enclosure if it’s got any moving parts going through the hull. One interesting possibility is a “wet” brushless motor – brushless motors don’t need any connections to the rotor, so you can build one with the rotor “in” the water but the rest of the motor completely watertight – for example, by flooding the coils with a suitable sealant. The bearings would be “wet”, which is a challenge (limits the choice of materials) but still easier than trying to seal a propellor shaft. I think Greggs idea is brilliant, like building your own mars rover! They are doing almost the same thing, and they have a huge headstart on FishPi with a launch due this month. Anyone interested in putting a Pi in an autonomous boat might also be interested in competing in the Microtransat Challenge (http://www.microtransat.org). This is a transatlantic race between autonomous sailing (wind powered) robots. We are having a series of little races between these boats in Cardiff in September, if anyone is interested have a look at http://www.microtransat.org/wrsc2012. Most of the current boats use Linux based computers of one form or another or Arduino’s, so I see no reason why a Raspberry Pi wouldn’t make a good controller. Might I suggest that the Fish Pi folks contact Roz Savage, the british woman who has rowed across the atlantic and pacific ocean on how to protect and insulate the electronics since she has probably among the most experience in this kind of thing. I followed her exploits on Twit.tv over the years and salt and corrossion are very, very big problems in these endeavours. Best of luck you crazy bastards!!! As someone entertaining the possibility of powering my pi from the sun, I am struck by the fact that they are completely omitted from your parts list. I assume FishPi will have panels orientated for south-facing on a journey, but wondered how that would affect self-righting and drainage or fouling of the deck. 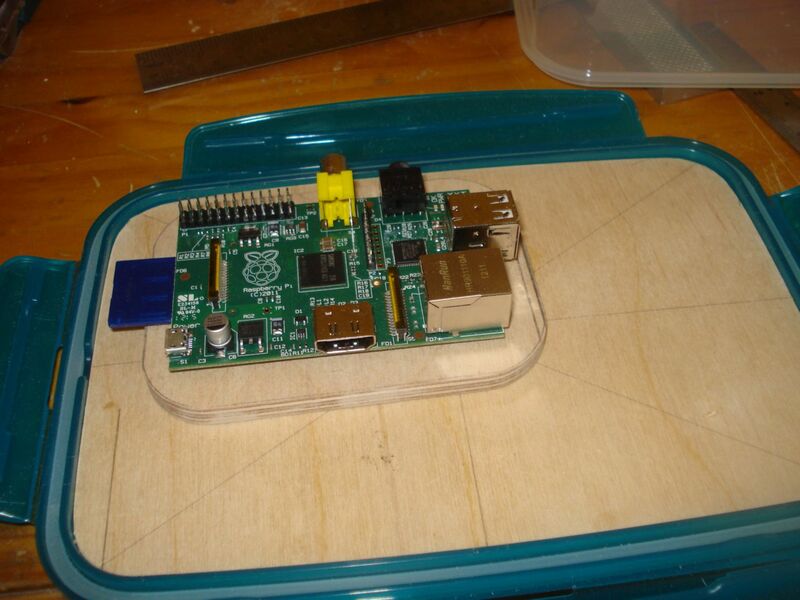 Completely flat layout would leave it needing a huge surface area to generate enough juice just to run the pi. I am currently hunting for 1 or 2 watt panels, but the sun is going down now, so not sure this will work anymore. Good luck Greg. Given the limited power available, wouldn’t it be better to keep to a single voltage on board? Then you can have more capacity in the same number of cells. I’m almost certain the RPi will run on 3.3v. The ARM certainly does, and the supply from the Micro USB connector goes almost immediately into a 3.3v regulator on the board. The 5v does get passed onto the USB ports, but I don’t think anything crucial requires a 5v source. You might have to bypass the regulator though, I don’t know if it’s an LDO or if it will take a chunk out of your 3.3v on the way past. NiMH batteries rarely get as many charge/discharge cycles as you’d want, and the amount of electronics to charge them properly makes them cost prohibitive. You actually have to monitor current rates, cell temperatures, and be prepared to shut off individual cells as they go bad, because one will inevitably fail quicker than the rest. Just relying on a basic charging algorithm that monitors voltage, as most commerical chargers do, turn the cells to soup in less than 100 cycles. NiCd is more robust and cheaper, if less environmentally friendly. Lithium Polymer might be something to look at as well. I would definitely consider a LiPo battery rather than NiMH. The power density is far greater, as is the available capacity. You could consider running the moter only at night, using the daylight hours to charge the battery. Self-righting is easy to achieve, which will endure that your PV cell is always in daylight. I echo all the comments on brushless v brushed motors. You will save weight, in addition to the increased reliability and efficency. I would have a word with your local model boat club – they will have already met and overcome many of the challenges you are about to face. A great project – I wish you much luck! How cheaply could you build a robot?